I finished reading the first volume of Superman: Grounded with some regret that writer J. Michael Straczynski won't truly be finishing this story in the next volume. The material Stracynzski covers here is not new, necessarily -- Superman saving a beaten child, talking down a suicide, inspiring an old man with his flying -- but that Stracyznski packs it all one right after another on this very "hard traveling heroes"-esque walking tour that Superman's taking, and especially right on the heels of the cosmic "New Krypton" storyline, is largely compelling. As with Wonder Woman: Odyssey, however, the moment Straczynski hands the reigns to another writer, it shows. I fear what interesting things Straczynski was trying to say with Superman in Grounded could be too easily overshadowed by fill-in stories that really have no place here. I give a lot of credit here to artist Eddy Barrows, and whomever decided to keep Barrows on this title between War of the Supermen and Superman: Grounded. I still feel Barrows's art is far too dark, with too-heavy lines -- see how much solid black there is on the splash page where Superman holds the crying jumper, and on the page after, and on the first page of the second full chapter -- but it shows Barrows's strength as an artist that he can draw both War of the Supermen's action sequences, Grounded's "talkie" moments, and also the truly gruesome "dream creature" in chapter four. And by having Barrows draw Grounded, it makes Grounded and "New Krypton" seem all of a piece -- if everything were working right, "New Krypton" deserves a Superman-centric, Earth-bound epilogue like Grounded, though in the days of the Triangle Titles this might be one month of epilogue stories with some scattered follow-up (see, for instance, the aftermath of Superman: Our Worlds at War) and not a twelve-part story to be collected in two almost-$25 hardcovers. I say "if everything were working right" because those of us inside the beltway know all of this appears to fit together much better than it actually does. Barrows's presence offers some continuity between War of the Supermen and Grounded, but in fact the two stories have entirely different creators, and Stracynzski's Grounded storyline only happens to coincide with "New Krypton," rather than organically emerging from it. Not to mention that with the next volume, Stracynzski chooses to step away from the Superman title given the DC Relaunch, leaving some fans understandably bitter and more significantly, not completing the thought he approaches through the beginning of this story. For a reader who picks up Superman books at their local bookstore without ever once perusing the inside baseball on the internet (of which I think there are far more of them than there are of us), War of the Supermen and Grounded seem to work wonderfully well together, and the idealistic part of me clings to that even as the rest of me knows much better. That's a pity, because what Stracynzski starts to say in Grounded is really rather interesting. Grounded begins with a post-War of the Supermen press conference, at which a woman slaps Superman because he failed to cure her husband's cancer while Superman was off on New Krypton. The woman's accusation and expectation for Superman is ludicrous and everyone in the gathered crowd tells her so, but the fact that Superman's superheroic duties are indeed "more important" than the husband's life affects Superman deeply. What follows is a string of sequences in which the police, regular people, Superman's fellow superheroes, even his loved ones all offer Superman excuses for why his responsibilities are greater than to regular people, why he should care less, and Superman keeps returning to why he should care more -- and it's remarkable. I very much like Stracynzski's characterization of Superman. Stracynzski's Superman is subversive, for one -- he sets fire to drug stashes hidden in private homes despite much talk about privacy rights and warrants; he threatens a stalker with bodily harm if the stalker keeps harassing his victim; he gives a little boy a phone number to call every day to be sure the boy's father isn't beating him; he even throws a basketball game to give a smaller teen a boost of self-esteem. This is a Superman assured of himself and his abilities, if not necessarily his place in the world; he deftly predicts the media will stop following him when they see there's nothing sensational to his walk across the country, and indeed they do. Stracynzski's Superman has a confidence that's immediately appealing. Read Part 2 of our review of Superman: Grounded. You know, I didn't hate "Grounded" as much as a lot of people seem to, but I actually started enjoying it more once Chris Roberson took over. That's interesting, I hear this book get a lot of flak for Superman's apparently inconsistent, preachy, half-hearted characterization. (Superman telling a small child to "give a message" to the drug dealers for him comes to mind.) Is Superman confident, or just pretentious here? I guess after New Krypton, you could cut him some slack, but still. People have said it actually gets better after Stracynzski leaves. I haven't actually read it, so I'm not sure what to think. Love comments where we get down to what's on the page. Let's look at the scene you mentioned. The kids are standing on the sidewalk when Superman walks up to the drug dealers, and after Superman burns the drugs it's the kid in question who makes contact, offering Superman some candy. Sure, we could venture outside the realm of the page that maybe Superman endangers the kid's life by asking him to give the dealers a message, but I don't personally read it that way -- that the kids are there before and that the kid approaches Superman serves to negate that for me. Superman asks the kid, essentially, to tell the dealers he'll keep burning their drugs. The kid says, "You know they're just gonna set up somewhere else, over there." Superman interrupts and says that his focus is this neighborhood, and that the next neighborhood has to take care of itself -- basically, that if everyone stood up against bad things in their own neighborhoods, then those bad things wouldn't have anywhere to go. 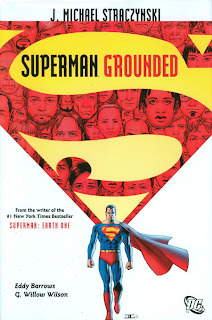 It's simplistic, sure, in the way all aphorisms are simplistic, and preachy maybe, though I think we can accept that by definition Grounded is a preach-ier comic than standard Superman fare. But I also think it's consistent with the message of the book. As I mentioned above, a woman slaps Superman for not curing her husband's cancer, a ridiculous notion, and everyone tells her it's ridiculous and that Superman can't be everywhere -- except Superman. The journey Superman embarks on is to tell people to do more so that he can in essence be everywhere -- he runs out the drug dealers, talks to the suicidal woman instead of just pulling her off the ledge, forces the aliens to help society rather than just being observers, and chides the police for not doing more for the obviously-abused boy. It's all a part of what Superman means when he quotes Thoreau -- for the dog-walker to take the time to ask Superman, "You're on a walk ... Shouldn't you be out saving the world or something?" is for the dog-walker to say that Superman's the hero and he's not; rather the dog-walker should be too busy saving the world himself to have any concern for Superman. Stracynzski told a story around when Grounded or Earth One came out about tackling a robber at a convention, and that he did it despite his personal safety because it's what Superman would do. I'm pretty sure that's part and parcel of what Stracynzski's getting at here -- that the existence of Superman in the fictional world or the concept of Superman in our world shouldn't be an excuse for regular people not to rise to the status of hero because Superman will handle it, but rather an inspiration for people to do more irrespective of Superman. To answer your question, then, I'd have to choose "confident" over "preachy," but rather I think it's all Superman's reaction to the woman slapping him; when everyone else is saying "do less," Superman's walking the country to tell people to do more. Thanks again for your comment. I'm looking forward to reading Chris Roberson's finale to this and seeing how Roberson's approach coincides or differs. Hey, thanks for the detailed reply! Love comics discussions. Hearing this, I suppose I'd conclude that yes, the message may be a little heavy, but no, Superman isn't inconsistent within the book itself. Still, the thought of Superman telling people to 'do what Superman would do' while standing there, clearly invincible, feels a bit strange. Minus the context, it would sound like Superman was just wandering around, telling people to stop relying on him and save themselves for a change. In order for a message like that to really get across, I'd expect Superman would need to go beyond speech-giving and somehow illustrate. The problem is that as Superman, he sort of can't illustrate. As a hero, anything he does is seen as something that can't be replicated, which is maybe the point the writer is driving at. That's why I found 'Smallville' to be a (sometimes) compelling take on "grassroots Superman" – because Clark didn't have Superman to hide behind. He was Clark, or the anonymous "Red-Blue Blur", and people were inspired by that – by the thought that a normal guy could be such an essentially good person. It's strange, but I think I've never seen that in Superman comics. Everybody knows Superman is a hero, and his heroics are seen as less impressive and less inspiring for that, despite the fact that they aren't. Still haven't read this book, by the way. But sensing I'm going to have to take a look now. This may be an instance where you have to see it. I think Stracynzski does have Superman illustrate the point, through some of the examples I mentioned -- talking to the suicidal girl when the police just want him to grab her, and forcing the aliens to come out of hiding and do good in the world, for instance. The plot of the book is not "Superman holds campaign rallies across the country," as you'll see. Yours is a very interesting take on Smallville that I hadn't considered. Given that Clark's powers are hidden, people just believe he's good and are better for it. I wonder if there's an episode that exemplifies this; I always thought it silly how in most episodes, whomever Clark was fighting or saving found out his secrets, by the end. Thanks again for your comments -- hope you'll comment again if you have a chance to pick up the book. Re: Smallville, I think that it's not a matter of Clark's powers being hidden, necessarily, as much as it is a matter of his powers having no accompanying expectations of heroism. In Smallville, a universe where plenty of people have powers but very few use them for anything but selfish purposes, a person is heroic not because of his powers, but despite them. The idea of someone using their powers for good, or simply not using them badly, is revolutionary. Clark is that revolutionary. In a world where everybody has superpowers, a superpowered guy diving in to a burning bus to save an unconcious woman is really just a normal guy diving into a burning bus to save an unconscious woman. It makes little difference whether the people know about his powers or not, because they explain how he does things, not why he does them. Everyone accepts that the Red-Blue Blur is superhuman in some way, but they're not surprised by the fact; they're surprised that he uses those powers to stop muggings. And within the circle of people who actually know who Clark is, they're not seeing Superman save Lionel Luthor's life – they're seeing some kid save a man who has been threatening his family for years. That's surprising to them because they don't expect it. It's a kid in a flannel shirt behaving like Superman, in a world where Superman has never existed. Thus, when people are inspired by Clark, they aren't concerned with being as good as Superman. They're concerned with being as good as some kid named Clark. Even when he's grieving, or uncertain, or kind of tired of the world, Clark is still concerned for others, and that's what's inspiring regardless of his powers. It's something more personal than a huge superhero story, and I think the comics miss out on that. We expect something spectacular when we see Superman, so it's hard for him to impress us. TLDR: I was thinking the episode where Clark meets Perry White in season three, maybe? Perry sets up this trap to prove he has superpowers, and Clark tries to save him even though he doesn't at the time. Smallville isn't a great show, but I think it has the right idea a lot of the time.